An otter checks the water for fish. Ray Kania photo. I followed the otter as it swam underwater. It occasionally poked its head above the narrow canal, checking to see if I had left. Nearby, white ibis used their downward curving beaks to probe the water for food while a great blue heron stood motionless, waiting for any small fish to venture close enough for a strike from its dagger-like beak. I noticed some turbulence below and, a second later, the otter broke the surface of the water with a large fish in its mouth. Wasting no time, the sleek brown creature slipped into the brush on the opposite bank and noisily commenced its morning meal. A myriad of creatures stalked their food in the morning light of an early June day across this part of the Merritt Island National Wildlife Refuge. The refuge land, owned by the National Aeronautics and Space Administation (NASA), is one of Florida’s best kept secrets. the changing habitats that make up the refuge. These diverse habitats, from salt marshes and shallow water to pine flatwoods, are maintained by the refuge managers. This diversity is the reason the area can attract and sustain such a variety of animals. Although Black Point is located in the non-operational part of the Kennedy Space Center (KSC), it is in the glide path of the KSC landing strip. Whenever the Space Shuttle returns from the north, it passes over the refuge only seconds before touchdown. Merrit Island is a well-known vacation spot for several hundred thousand “snowbirds” migrating south for the winter. Many of these visitors, from ducks and raptors to songbirds, can be found here from October to March. The refuge remains an active place year round, however, as residents move across the land in their search for food. In the spring, when mating takes place, nests are built and in a matter of weeks, another generation begins life throughout the marsh environment. 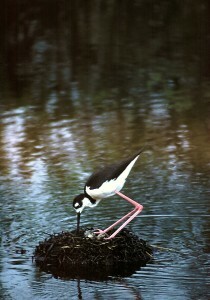 A stilt tries to protect its eggs from the rising water. Ray Kania photo. If you have a few weeks to spare, one of the more enjoyable creatures you will encounter is the black-necked stilt. This fragile-looking bird is black on top and white underneath. It has a long, thin bill that curves upward slightly at the end. Its most noticeable feature, though, is a pair of very long, skinny pink legs. It appears to be walking on stilts as it moves across the shallow water. Black-necked stilts build nests on mud flats in late spring, often close to the roadway. Incubation of the eggs is shared by the male and female. If the water rises and the nest appears ready to float away, a stilt will frantically scour the area around its nest, picking up twigs with its bill, then dropping them. It seems confused as to what course of action is needed to remedy the situation. At stop 8 along the drive is the Cruickshank Trail, a five-mile foot trail named after Allen D. Cruickshank, a naturalist who played a significant role in the development of the refuge. The trail includes an observation tower and a photo island accessible by a wooden footbridge. Whether you are on the foot trail or the main drive, stop and observe for a while. There is constant movement across the refuge and before long some of this activity will cross your path. It may be a pair of black skimmers flying inches above the surface of the shallows, their elongated lower bills scooping up water containing nutrients. Or maybe an osprey will pass overhead enroute to its nest, a fish held tightly in its powerful claws. The resident otters can usually be found between stops 1 and 3, swimming up and down the canals. Sometimes one will stop, raise its head above the water and observe the observer. After a few seconds of staring, it will give a grunt, then dive into the murky water and resume the fish patrol. 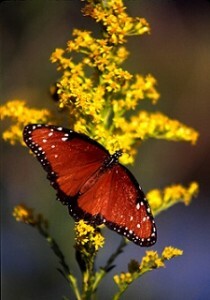 Butterflies are excellent subjects for your photo collection. Ray Kania photo. The ideal time for observing the refuge wildlife is early morning before 10:00 am or late afternoon after 5:00 pm. I prefer the morning since the heat is more tolerable and I have seen more species during this period. Visitors can drive their cars or campers on the road or take a leisurely bike ride. Traffic is light. Most of the birds are only mildly curious about the vehicles passing by. But a person approaching on foot will sometimes cause the excitable ones, such as the egret, to fly away. Other species often follow their example and move downrange 100 yards or so. 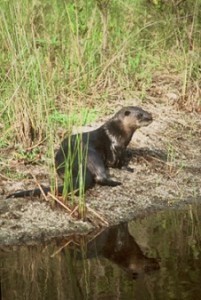 Some of the creatures you may encounter along the trail include marsh rabbits, snakes, wild pigs, alligators and bobcats. Alligators, for the most part keep a low profile, often submerging when the presence of humans is detected. However, I noticed a couple of young gators, 3 to 4 feet in length, that liked to lay in the sun around a shallow pool at the entrance to the trail. And I once met a bobcat strolling lazily on the roadway. It gave me a glance, then sauntered into the dense foliage. Just after sunrise mosquitos can be a problem so wear sufficient clothing and apply repellent on exposed areas. There are no amenities in the refuge so visitors should bring something to drink. Also, any trash produced should be taken out with you since there are no receptacles. If you plan to photograph the wildlife, you need a telephoto lens to get the best shot. I use a 300 mm to a 500 mm lens. To reach the Blackpoint Wildlife Drive, take Hwy 406 east from U.S. 1 at Titusville and head across the Indian River. Bear left after 3 miles and look for an entrance sign. The drive is free. See complete information.